I've read interviews where he denies being a "student of folk music" and interviews where he says he is really a folk musician singing in a hard rock band. I'll bow to your studies in folk, but, in the above quote he was referring to being an acoustic musician playing in front of an electric rock band. He has made that reference many times and has been something he has wrestled with since the early 70s as I had mentioned. His statements, in 77 and 78, about being labeled a folk rock band have been fairly tearse. Then again he'll tailor his answers to whatever serves his purpose at the time. Some great discussions going on here. I think even Ian's early influences go someway beyond just English Folk. Ian understood, better than many, that the Celtic folk themes or passages he created to many early post-This Was tracks appealed to a much wider 'ethnic' or world music audience. I've always thought that's why Tull are so readily picked up in countries like Spain, Greece, and more latterly eastern European and Asian countries. I think even Ian's early influences go someway beyond just English Folk. Ian understood, better than many, that the Celtic folk thrmes or passages he created to many early post-This Was tracks appealed to a much wider 'ethnic' or world music audience. I've always thought that's why Tull are so readily picked up in countries like Spain, Greece, and more latterly eastern European and Asian countries. Ian is talking about being fed up with people hearing, say sitar claiming that "real" music is now being played. Yet no one was studied in this form in the least. He was and remains a believer in "sophomore" exploration in certain styles on instruments that you are still learning. That you discover phrases and styles on your own. You dont get trapped in well worn phrases and chord progressions. Agreed he tailors his responses to benefit whatever he wants to convey (don't we all sometimes). You're right, the quote I was referring to was him calling himself an acoustic musician, but I think the actual quote that I had in mind was from an interview with Crawdaddy in 1971--I mixed up the two, my mistake. Crawdaddy: Your music seems much less jazz and blues oriented. There seems to be much more folk songs, or ballads. IA: You hit it when you said folk songs because really what I am is a folk singer and that's the honest truth, more than anything else, inasmuch as what I'm singing about is the folk music of today. Of course he is making the distinction that what makes him a folk musician isn't "folk music" in particular. I do think his early influences certainly go beyond English folk--that is very apparent, no doubt. But I don't think, even throughout his career, that the world influences had nearly as much of an impact on him as English folk did--naturally. But Darin, the humorous thing about Ian is that he revises his own history at the drop of a hat, particularly when he's feeling grumpy (and he's been getting grumpier as the years pass). He may say he "despises" folk music, but in effect he subsumed British folk material into his repertoire very early on and expanded on that influence with varying degrees on each album. It's rather like him despising the idea of the "dreaded concept album", but then recording several, including TAAB2 just recently. Not to mention that he's consistently recorded with members of Steeleye Span (like Maddy Prior on "Too Old to Rock and Roll"), and Fairport Convention (Dave Pegg, Dave Mattacks, Maartin Allcock, etc.). Ian has even played at Cropredy for Christ's sake. You don't have so many significant ties to a musical genre if you despise it. I could go on, and it would be fun, but I unfortunately have other things to attend to. At the time (mid 70s) Both Ian and Martin professed a disdain at being classed as a "Folk Rock" band. They didn't dislike Folkies but they (Tull) were first a rock band that had over the years learned how to integrate Ian's acoustic guitar into the electric side of Tull. Yes, yes and even produced one of Steeleye's albums. I agree with your "Folk associations" but with a healthy mix of pentatonic "blues associations" all puristic relations blown away. 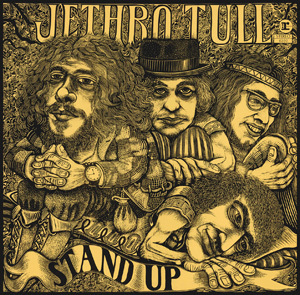 Aside from 5 or so songs (mainly Christmas songs) Tull was not in the practice of re-working Traditional folk tunes, something that most all the "Folkies" did on a regular basis. If it's a label, so be it. He is guilty of appropriating many other styles as well. Absolutely agreed. I just don't think Ian was "influenced" as was originally stated much as he just downright borrowed the sound. Remember 7th and 9th chords were not allowed in Tull music (per Don Airey), I'm guessing for a reason. And for us non-musos out there would you mind sharing the reason? Well in the context that Don Airey said it, was that there were things you just didn't do, (now I need to find that) might Be in an AND interview) I'm sure it was because it "sounds like jazz" . Most of Tulls music are in the "Church modes" or major and minor scales. "Steeleye Span have teamed up with author Terry Pratchett to create an album based on his Wintersmith novel. The Discworld series creator is a long-standing fan of the band, and had them appear at his 60th birthday party in 2008. Some of the material in progress is being performed on the band’s current UK tour, which runs until the end of March. Wintersmith, Pratchett’s 35th title, was published in 2006 and is the third to feature his character Tiffany Aching. Aimed at younger readers rather than the mainstream Discworld audience, it was named Best Book For Young Adults by the American Library Association in 2007. The Wintersmith album will be Steeleye Span’s 22nd studio release, following 2009′s Cogs, Wheels And Lovers. Mar 31: Assembly Hall Theatre, Tunbridge Wells"
First collaboration I think since Greenslade's "The Wizard's staff has a knob on the end."